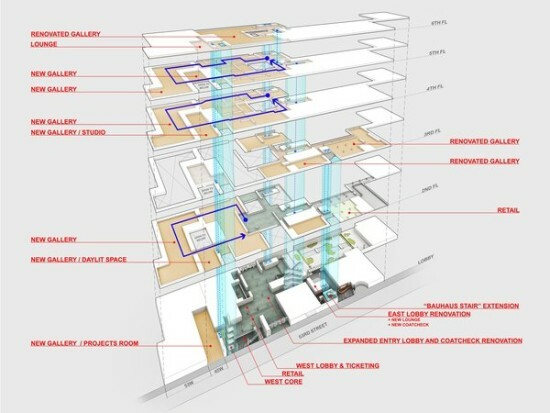 When MoMA debuted its Diller Scofidio + Renfro (DS+R)–led expansion and renovation plans in 2014, the reaction from the public was overwhelmingly negative. 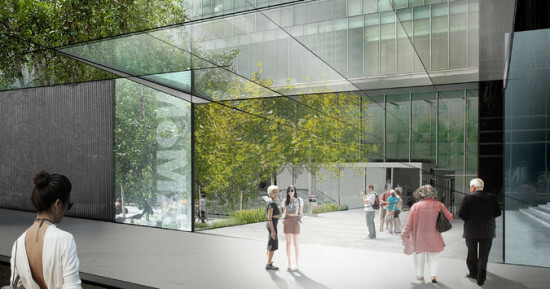 Those plans called for demolishing the Tod Williams and Billie Tsien–designed American Folk Art Museum and creating a glass curtain wall that would open MoMA’s entire first floor to the public, for free. It’s not the free part critics took issue with: It was the perceived chaos of the museum-goer experience and wholesale destruction of the folk art museum. MoMA took note, and pulled plans back. This week, revised plans were revealed. DS+R is still the architect (with Gensler), and the original objective—to create unfettered movement between galleries—remains. But a lot has also changed. 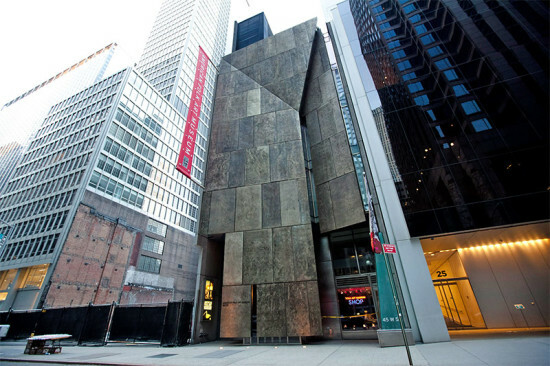 Plans call for connecting galleries in Jean Nouvel’s planned residential tower at West 53rd Street, the new DS+R addition, galleries in the site of the former American Folk Art Museum, and the current MoMA building to broaden public access and accommodate skyrocketing attendance. Renovations and new construction will add 50,000 square feet of exhibition space, and expand the lobbies. When construction is complete, MoMA will be 744,000 square feet, or 17 percent, larger than it is today. Given the museum’s increasing popularity, more people will see these new concepts in practice. Since 2004, the year that Yoshio Taniguchi‘s $858 million addition opened to the public, the collection has grown by 40 percent, the number of yearly exhibitions has increased from 15 to 35, membership has reached 150,000, and attendance has doubled to three million annual visitors. The project is being split into three phases so the museum will not have to close completely. DS+R’s structure will be the last of the three: The first phase will be changes to the Lauder Building, where audiences now enter for film screenings, followed by renovations to the Taniguchi building. 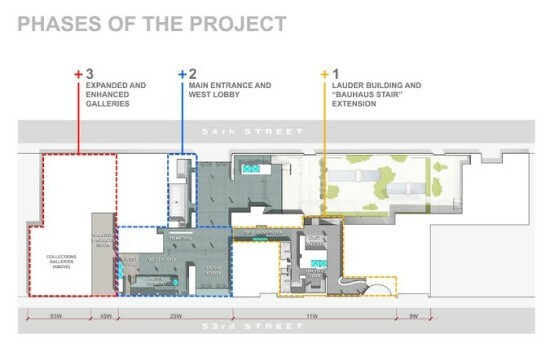 The Lauder building’s east lobby will be expanded to improve crowd flow to the main lobby, and the gift shop and bookstore will be moved below ground to facilitate the expansion. Broadening public access will be achieved by different means than those put forth in the plan’s first iteration. A new public entrance to the 54th Street sculpture garden was nixed due to security concerns. The “Art Bay,” a retractable glass door would have allowed museumgoers to enter ground-floor galleries straight from the street, has also disappeared from plans. 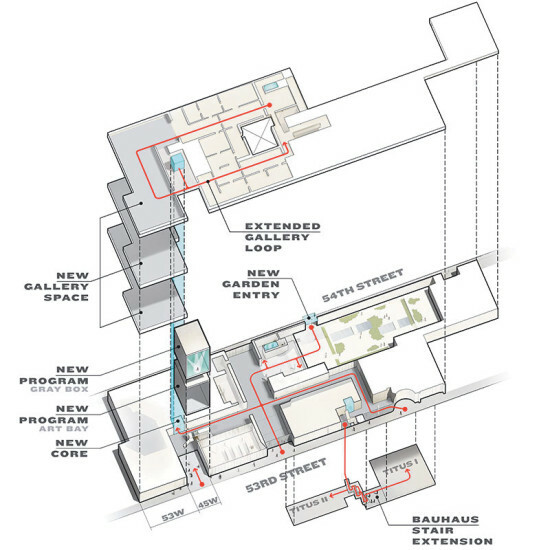 Instead, the first floor will have a free gallery with two exhibition spaces (one double height, for MoMA’s Project Series) that’s open to the public, but accessed through the museum lobby. A new canopy and a double height ceiling at the 53rd Street entrance will give extra visibility to the museum’s main entrance. The double height ceiling will displace the media gallery, whose contents could be moved to a fourth floor gallery for media and performance. To accommodate larger pieces, or pieces of the future whose spatial requirements cannot yet be determined, none of the new galleries will have permanent walls, and collections galleries will be almost column-free. The four third-floor galleries (including galleries for architecture, photography, drawings, and special exhibition) will be merged into two galleries of 10,000 and 5,000 square feet. Glass, steel, and stone will be traded for a warmer palette to unify the changes. Construction on the $390 to $400 million project will begin next month. Although completion is contingent on the project timeline of the Nouvel building, all construction is expected to be complete by 2019 or 2020.